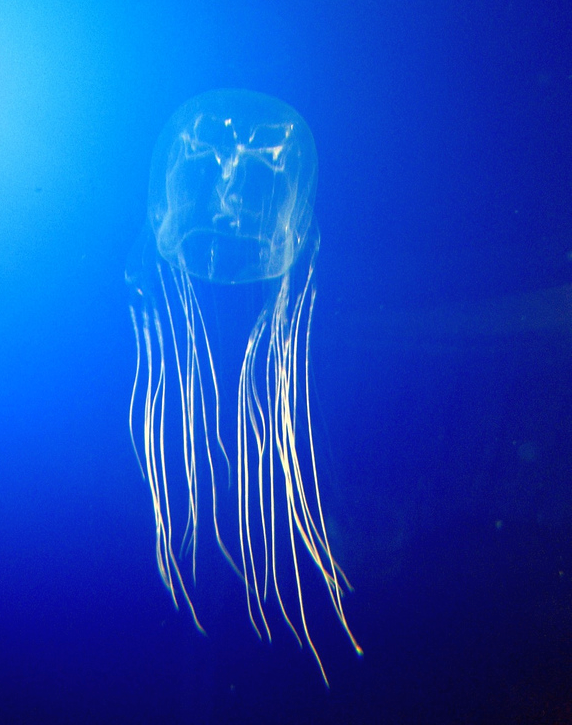 Category Archives for "Travel Health"
In her post on Water deaths in Australia, Cleopatra introduced us to the Box Jellyfish. As a man whose maritime experience is confined to Mare Nostrum, I confess, I not heard about them before then. Since most Cnidarian, especially those classed as Cubozoa, don’t have ability to read maps, I figured there was no reason that that confine themselves to Australia. Which is why I was dismayed to hear about a 20 year old German woman who died at a popular Thai resort after taking an evening swim where this third reported fatality in Thailand in 14 months from a box Jellyfish. Continue reading.. The recent rains hitting the southwest has brought concerns about Mosquitoes but it is not their bite per se that are the problem, it is the hidden virus that those bites brings. For Texas, the main virus of concern is West Nile Virus (WNV) where Harris county – which houses city of Houston – has already reported first case of WMV in May 2015. Normally WNV occurs later in the summer. The sprayers are out but with that amount of standing water, it is impossible to eradicate. In most people WNV has flu like symptoms but for more elderly people or immune compromised, it can lead to meningitis or encephalitis. In non-medical terms that is brain swelling. As for preventing WNV, there is no vaccine against it and it’s treatment will only be management of the symptoms. The best you can do is to protect yourself against bites especially when the mosquitoes are active around dawn and dusk. There is another disease called “Chikungunya” that is spreading up from Central America via mosquitos. Symptoms of Chikungunya are typcially a fever and severe joints pains. Unlike the mosquitos that carry WNV, the ones that carry chikungunya, bite during the day. One particularly aggressive Mosquito that carries Chikungunya is the Asian tiger mosquito which is distinct in it’s black and white looks. It can also hear it buzzing. It is not a native to US but an immigrant species. It bites everything – cats, dogs and humans. Thinking of getting away from this by going North or East. Not so fast. There is St. Louis encephalitis virus (SLEV) to consider that occurs in more temperate zones late in the summer. Most cases of SLEV disease have occurred in eastern and central states. Most persons infected with SLEV have no apparent illness. Initial symptoms of those who become ill include fever, headache, nausea, vomiting, and tiredness. Severe neuroinvasive disease (often involving encephalitis, an inflammation of the brain) occurs more commonly in older adults. In rare cases, long-term disability or death can result. What about quitting the US and going somewhere far away like Australia? Not so fast. They have their own version of WNV called “Kunjuin virus” in Queensland. So accepting mosquitos are out there waiting to bite, what can you do about them: Consumer reports did some tests. Best products are the ones with Deet as an ingredient. For the first time ever in Consumer Reports’ tests of insect repellents, new, safer products—made with milder, plantlike chemicals—were the most effective. (Check our insect repellent Ratings and buying guide.) The top scorers outperformed products that contained deet, a chemical that did best in our previous Ratings but can cause serious side effects. That’s why an effective bug-avoidance strategy requires a full arsenal. Our new tests identify non-chemical approaches that offer some relief (setting up a fan on your back patio, for example) and those that don’t help much if at all (think citronella candles, wristbands, and “all-natural” products with geraniol, lemongrass, and rosemary oils). Since West Nile virus (WNV) was first isolated in 1937, it has been known to cause asymptomatic infection and fevers in humans in Africa, West Asia, and the Middle East. Human and animal infections were not documented in the Western Hemisphere until the 1999 outbreak in the New York City metropolitan area. Since then, the disease has spread across the United States. In 2003, WNV activity occurred in 46 states and caused illness in over 9,800 people. WNV is transmitted to humans through mosquito bites. Mosquitoes become infected when they feed on infected birds that have high levels of WNV in their blood. Infected mosquitoes can then transmit WNV when they feed on humans or other animals. WNV is not contageous from person to person and there is no evidence that a person can get infected by handling live or dead infected birds. But, to add a further level of safety, if birds or other potentially infected animals must be handled, a protective barrier (e.g., gloves, inverted plastic bags) should be used. Most WNV infected humans have no symptoms. A small proportion develops mild symptoms that include fever, headache, body aches, skin rash and swollen lymph glands. Less than 1% of infected people develop more severe illness that includes meningitis (inflammation of one of the membranes covering the brain and spinal cord) or encephalitis. The symptoms of these illnesses can include headache, high fever, neck stiffness, stupor, disorientation, coma, tremors, convulsions, muscle weakness, and paralysis. Of the few people that develop encephalitis, a small proportion die but, overall, this is estimated to occur in less than 1 out of 1000 infections. When outdoors, wear clothing that covers the skin such as long sleeve shirts and pants, apply effective insect repellent to clothing and exposed skin, and curb outside activity during the hours that mosquitoes are feeding which often includes dawn and dusk. In addition, screens should be applied to doors and windows and regularly maintained to keep mosquitoes from entering the home. Most people infected with chikungunya virus will develop some symptoms. Symptoms usually begin 3–7 days after being bitten by an infected mosquito. The most common symptoms are fever and joint pain. Other symptoms may include headache, muscle pain, joint swelling, or rash. Chikungunya disease does not often result in death, but the symptoms can be severe and disabling. Most patients feel better within a week. In some people, the joint pain may persist for months. People at risk for more severe disease include newborns infected around the time of birth, older adults (≥65 years), and people with medical conditions such as high blood pressure, diabetes, or heart disease. Once a person has been infected, he or she is likely to be protected from future infections. The symptoms of chikungunya are similar to those of dengue, another disease spread by mosquitoes. See your doctor if you develop the symptoms described above. If you have recently traveled, tell your doctor. Your doctor may order blood tests to look for chikungunya or other similar diseases. There is no medicine to treat chikungunya virus infection or disease. Take medicines, such as ibuprofen, naproxen, acetaminophen, or paracetamol, to relieve fever and pain. On Jan 9th, it was 19. Jan 12th, it is 26. I refer to the recent measles outbreak that has been linked to visiting Disneyland during Dec 15 to 20th. The first six cases showed a correlation to not being vaccinated: 3 were children old enough to have a vaccine but did not, the other 3 were adults with 1 was not being vaccinated, another partially vaccinated and the other was just unlucky. The safest protection is the vaccine. Back in 2000, Measles was officially eradicated in the US. Now with the hysteria of Vaccines being linked to autism, more parents are not getting it for their kids. This has led to a re-occurrence of this preventable illness in the US -see the graph – as there is now more opportunities to catch it. To stop measles outbreaks, more than 95 percent of people need to be fully immunized. Common measles complications include ear infections and diarrhea. Ear infections occur in about one out of every 10 children with measles and can result in permanent hearing loss. Diarrhea is reported in less than one out of 10 people with measles. Some people may suffer from severe complications, such as pneumonia (infection of the lungs) and encephalitis (swelling of the brain). They may need to be hospitalized and could die. As many as one out of every 20 children with measles gets pneumonia, the most common cause of death from measles in young children. About one child out of every 1,000 who get measles will develop encephalitis (swelling of the brain) that can lead to convulsions and can leave the child deaf or mentally retarded. For every 1,000 children who get measles, one or two will die from it. Subacute sclerosing panencephalitis (SSPE) is a very rare, but fatal disease of the central nervous system that results from a measles virus infection acquired earlier in life. SSPE generally develops 7 to 10 years after a person has measles, even though the person seems to have fully recovered from the illness. Since measles was eliminated in 2000, SSPE is rarely reported in the United States. Among people who contracted measles during the resurgence in the United States in 1989 to 1991, 4 to 11 out of every 100,000 were estimated to be at risk for developing SSPE. The risk of developing SSPE may be higher for a person who gets measles before they are two years of age. Tara Haelle in her blog on Forbes raises some good points about Measles and tourist magnets like Disneyland. The first is the amount of young children below 12 months who may go to places like Disneyland but are too young to have their first vaccine. The second is that the resorts attract a large number of children with weakened immunity systems. Disney grants 7,000 wishes to 14,000 applications. California also seems to a hotbed of parents not getting their kids vaccinated so this may be a factor here. This is not just a US phenomenon. In 2014, the Philippines experienced a large measles outbreak. Many of the cases in the U.S. in 2014 were associated with cases brought in from the Philippines. The UK back in 2013, saw similar upticks due to parents not getting vaccines. 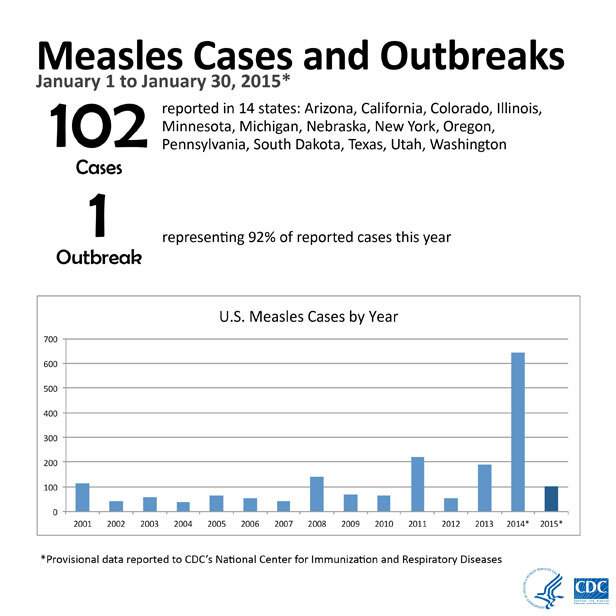 The measles uptick is the past few years is something to note and take action on. Parents get a Vaccine for your kids. Adults get a booster. If you have kids younger that are 12 months or younger, do NOT take them to any of the incubation places which attract hordes of kids or exposes them on international travel. Wait until they are older and are vaccinated.